The Mount Rushmore National Park is a national park in South Dakota that features giant sculptures of four presidents. The sculptures are carved into the side of a granite mountain. The sculptures are of George Washington, Thomas Jefferson, Theodore Roosevelt, and Abraham Lincoln. 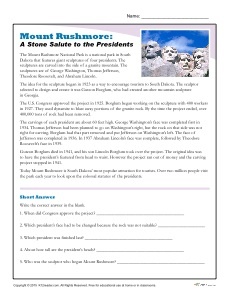 In this activity, students read informative text about Mount Rushmore and answer questions.